“Charlie Gracie was a rock pioneer and rhythm and blues singer and guitarist from Philadelphia, PA. The owner of Cadillac Records, Graham Prince, heard one of Gracie’s early radio performances, contacted the young musician and signed him to a recording contract. This association yielded the single ‘Boogie Woogie Blues’. 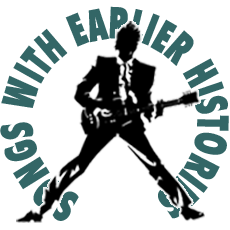 By 1956, Philadelphia had given birth to the new Cameo record label. Its founders, in search of a strong talent, signed Gracie later that year. With a $600 budget, this new union went into the recording studio to record ‘Butterfly’. It became a hit record. “Two other substantial sellers followed: ‘Wandering Eyes’, his third Billboard Top-100 hit, which peaked at #71 (another #6 in the UK), and ‘Cool Baby’ (also a Top-30 hit in Britain). The financial success of these hits bankrolled the Cameo label, which became a dominant force in the music industry for several years. “Gracie’s personal appearances grew until he performed and headlined some of the biggest venues of that time: Alan Freed’s rock and roll shows at the Brooklyn Paramount, The Ed Sullivan Show, American Bandstand and the 500 Club in Atlantic City, New Jersey. He appeared in the 1957 film Jamboree and toured with Chuck Berry, the Everly Brothers, Bo Diddley and his close friend Eddie Cochran.